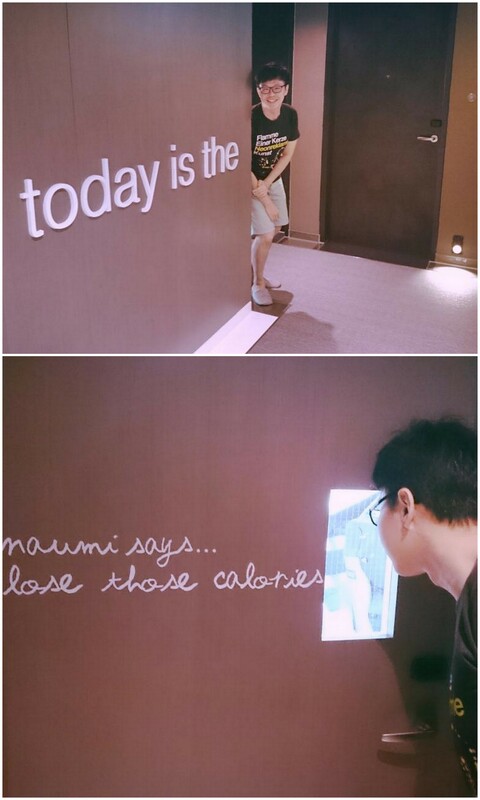 Our unforgettable 2D1N Staycation At Naumi Hotel! 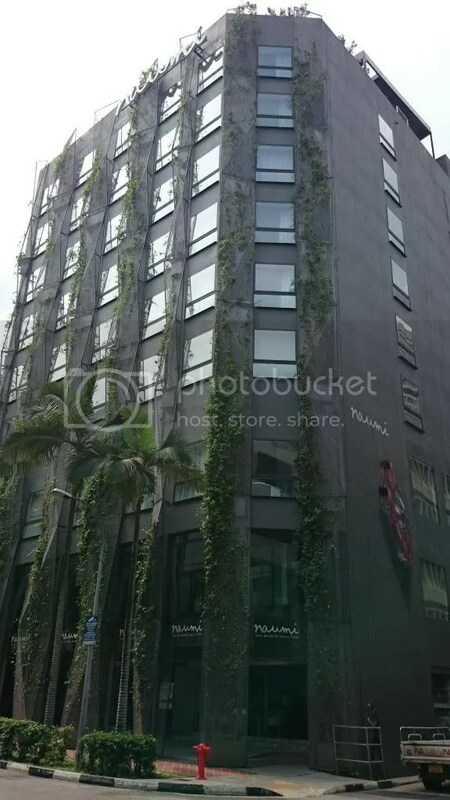 A Singapore partner of Small Luxury Hotels since Year 2007, Naumi Hotel is a state-of-the-art hotel boutique hotel with a selection of 73 elegantly appointed rooms to cocoon you in comfort. Situated 20 minutes away from the Changi International Airport, Naumi Hotel is set in the heart of the Singapore’s Central Business District and a myriad of inner-city shopping centres, host of art, dining, and entertainment spaces. 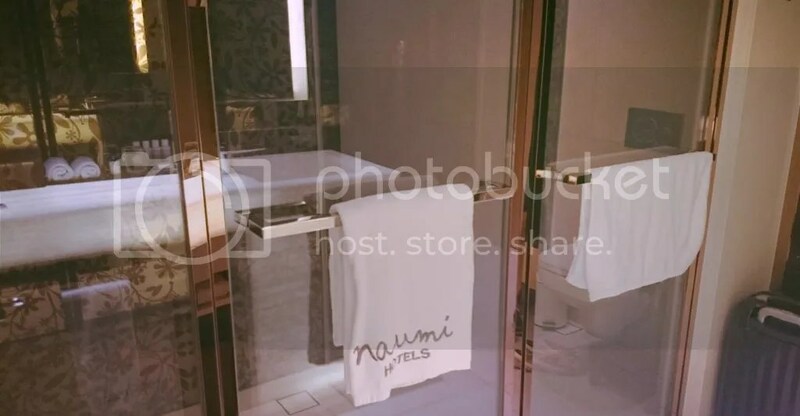 Since establishment, Naumi Hotel has won many awards such as the Travellers’ Choice – Top Hotels, Luxury Hotels, Hotels for Service and also One of the Best Place to Stay in the World. Upon stepping in, we were greeted warmly by the hotel staff (Always love attentive, service oriented and polite employees!). 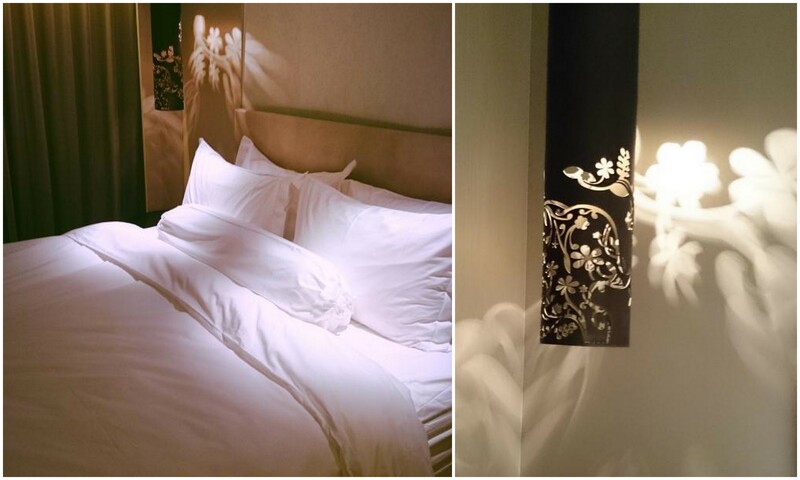 The interior of the hotel has clean, cozy and inviting modern furnishings! Not to mention, every part of the hotel smells really nice too! As check in time was at 2pm, we left our luggage at the concierge and off we went for lunch at a nearby shop that serves really nice chicken rice! 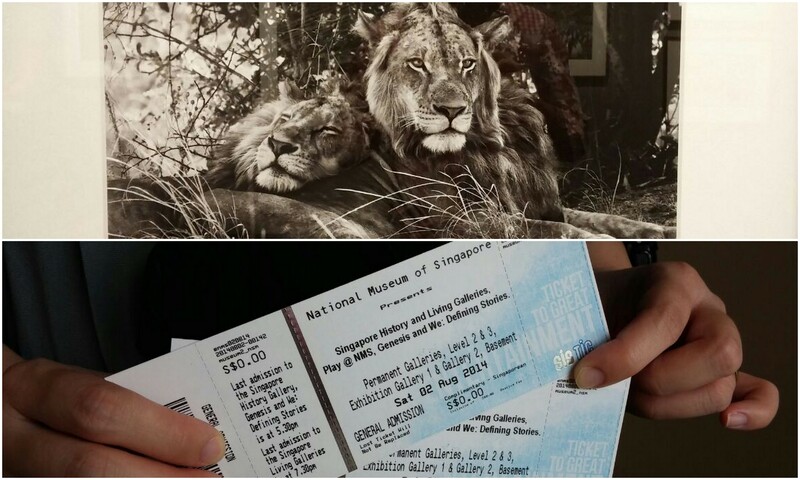 As we still have some time to spare, we dropped by the National Museum of Singapore which is within walking distance from Naumi Hotel as the birthday boy would like to immerse himself in the exhibits and displays at the National Museum of Singapore. 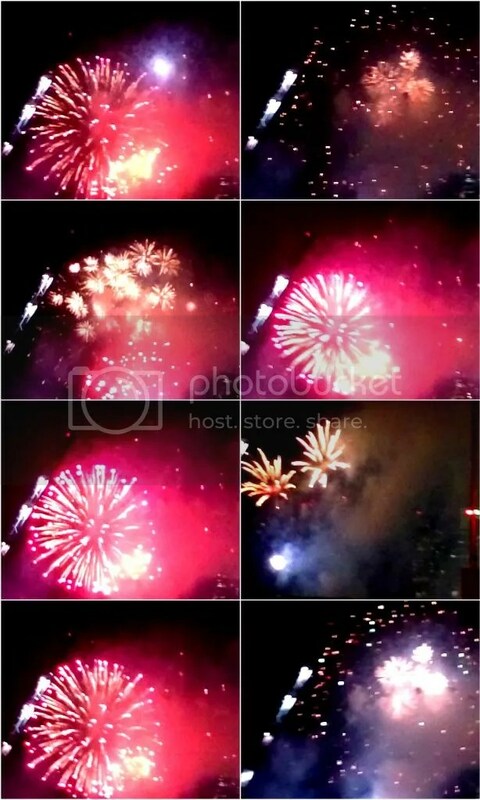 Got back to the hotel at 3pm and the hotel staff wasted no time and brought us up to the room. I have to make a special mention on their 5 star service as each and every staff are full of smiles and always so helpful. From the lift lobby, the lift and to the corridor, We are impressed by the futuristic artworks. Was telling my husband that i love the 3D artwork especially at our room’s level (Sigh! 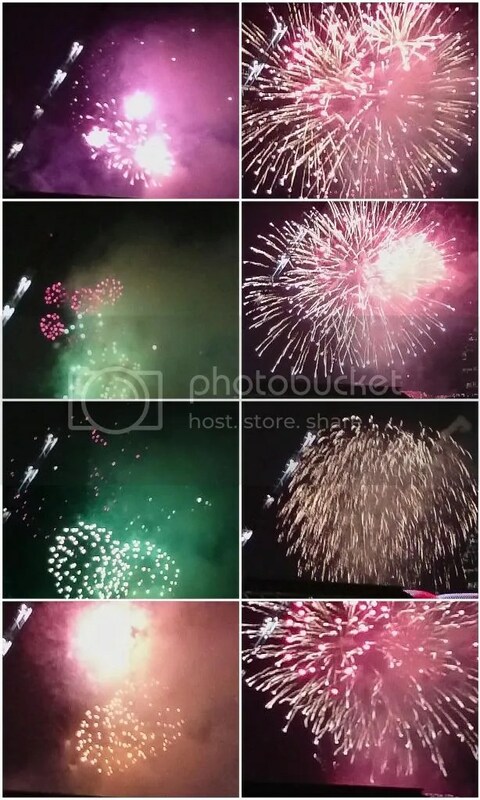 I forgot to snap some pictures)! 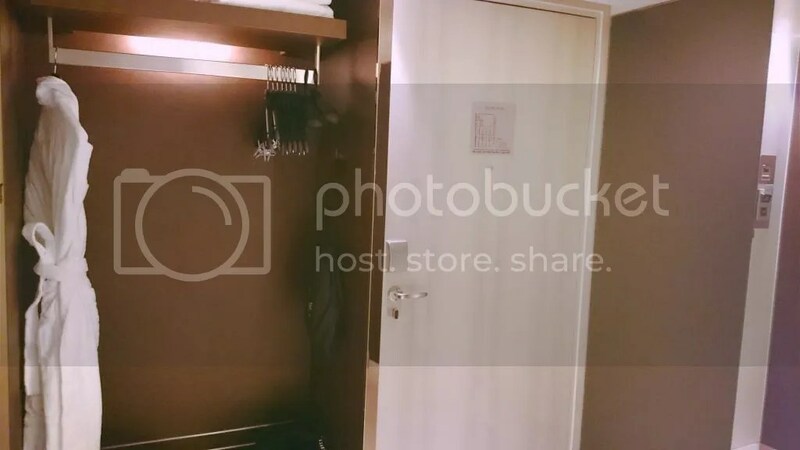 To access to the floor whereby the room is located, access card is needed so you need not worry on the security and privacy aspects. After a detailed room tour, i was busy KPO-ing and trying every single switch, tap and electronic appliances in the room. 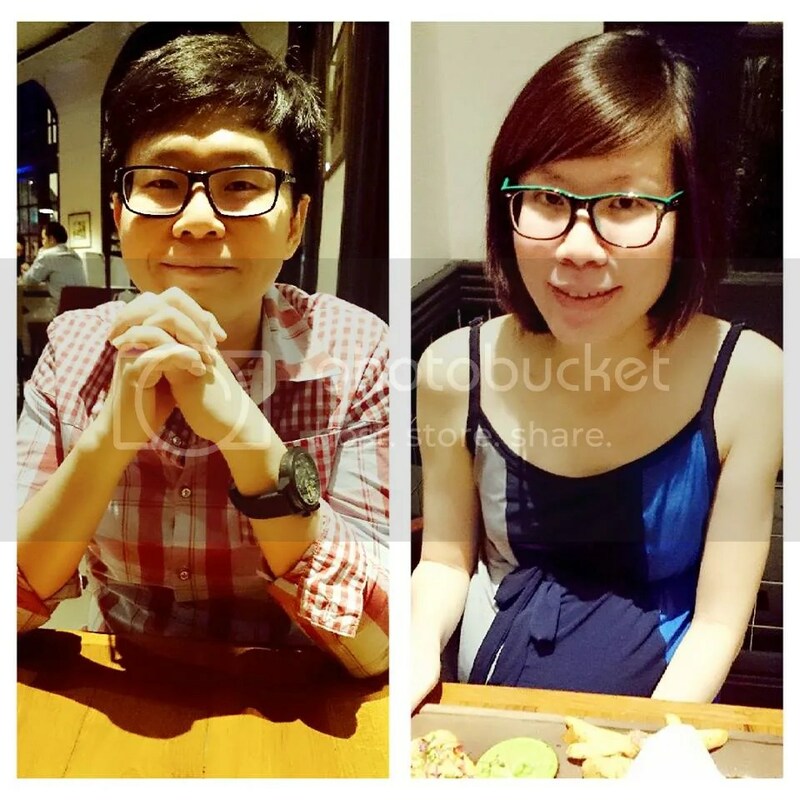 The husband kept himself busy snapping pictures so that i can blog more on our staycation experience. The Habitat room is on the small size so it is perfect for no more than two. To compensate for the small space, each and every corner of the room and furnishing are well-designed to made the room clutter free so you can move around easily. Many things are cleverly hidden in parts of the room so that they don’t take up much spaces. 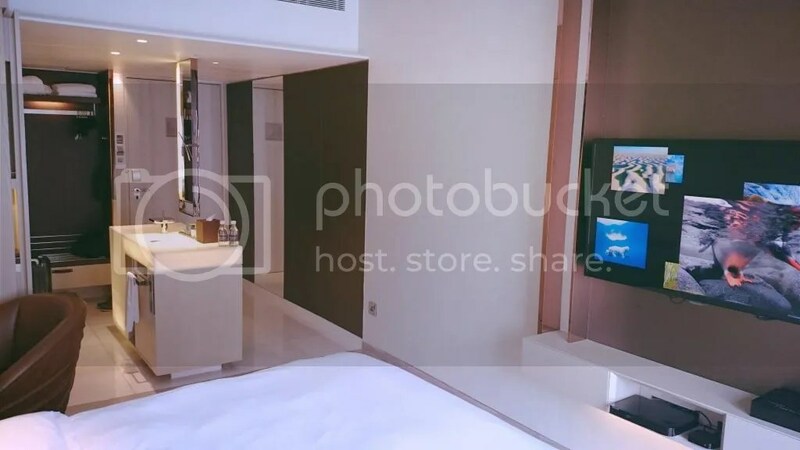 The room is decorated with warm earthy tones, exotic woods, lavish glass, and radiant LED lighting to create the ideal getaway in an urban environment. Overall, the room is well equipped, tastefully done up, cozy and has a luxurious feel with stylish furnishings. Not sure about you but we will always tend to check out the bed to see if it comfy whenever we are in a hotel. Quality sleep is very important to us and this is why we invested in good quality mattress / beddings. 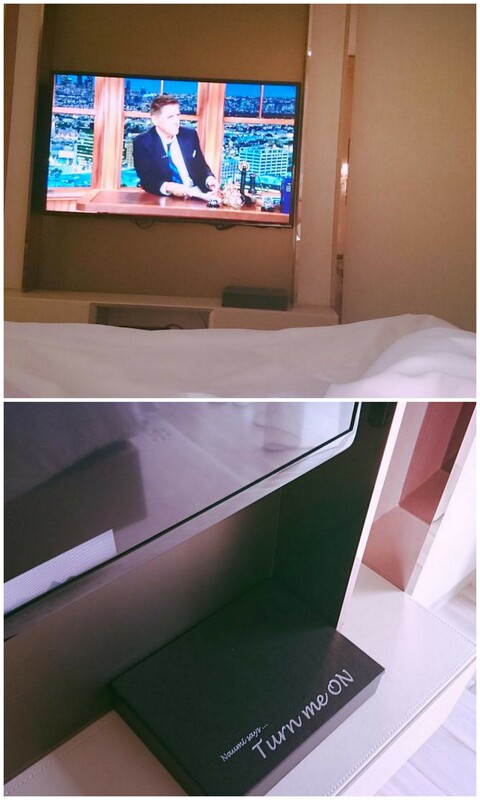 Although a queen size bed is provided in the room (i would love a king size one! ), Naumi has decided to indulge and pamper all guests with seven-layer bedding in 400 thread count Egyptian cotton!! It feels like silk on skin and it is so so comfy that i was telling my hubby that i want a set as well! If not for my hubby who cannot stay still at a place for too long, i would have lie down in that bed all day… Sleep quality was good as four plush pillows are provided… You know how i dislike many hotels giving the guest ‘skinny pillows’ that will sink in so much till there’s no support upon resting on it. Quality sleep doesn’t stop at all these as Naumi also provides a bolster to hug! It is really thoughtful of them as i need a bolster to support my legs and to cushion my belly! What we love about bed frame is extra storage space! 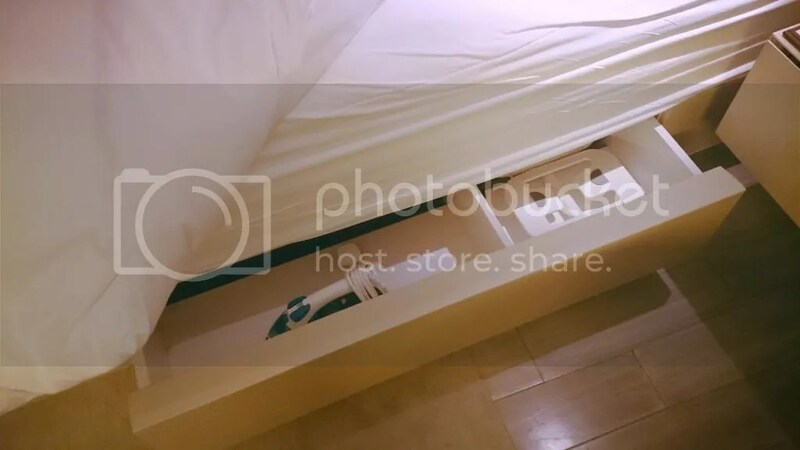 One space-saving tip is to get a storage bed frame whereby you can house some items to decluster.. Underneath, you will find an ironing board and iron whereby you can keep your clothes wrinkle free. 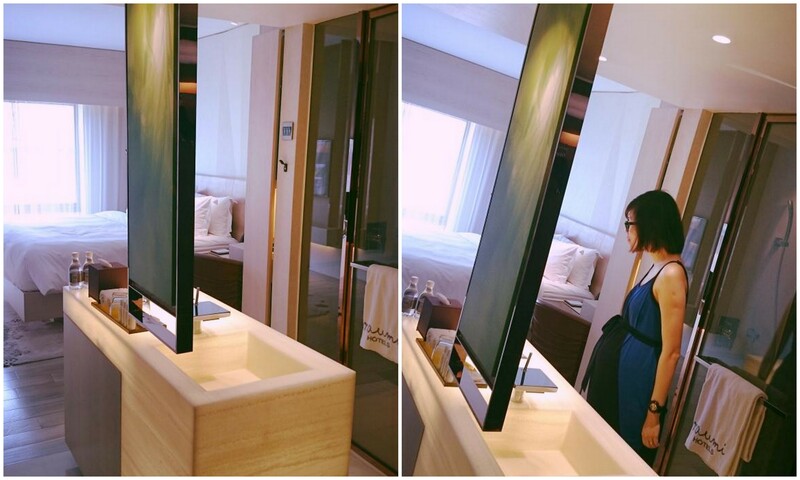 For Apple lovers, the room comes with Apple TV whereby you can conveniently play whatever you want with your phones! Naumi also provide free rental service of game consoles and DVDs upon request. 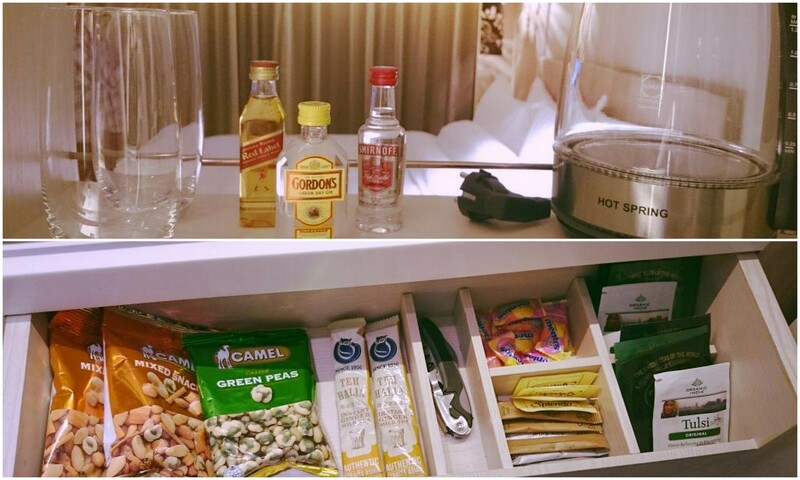 Our stay comes with a complimentary minibar / snack bar complete with liquor miniatures, coffee, tea, snacks and soft drink! 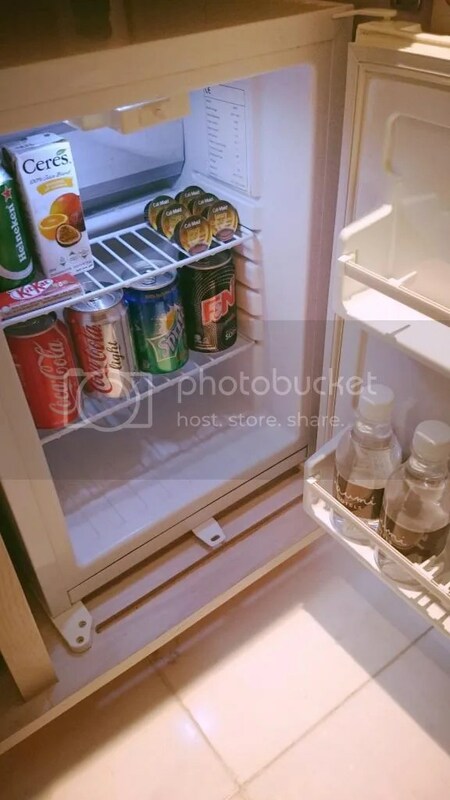 Like what the hotel staff told us, everything you see in the hidden minibar cupboard is free (The cupboard is hidden near the sink area). 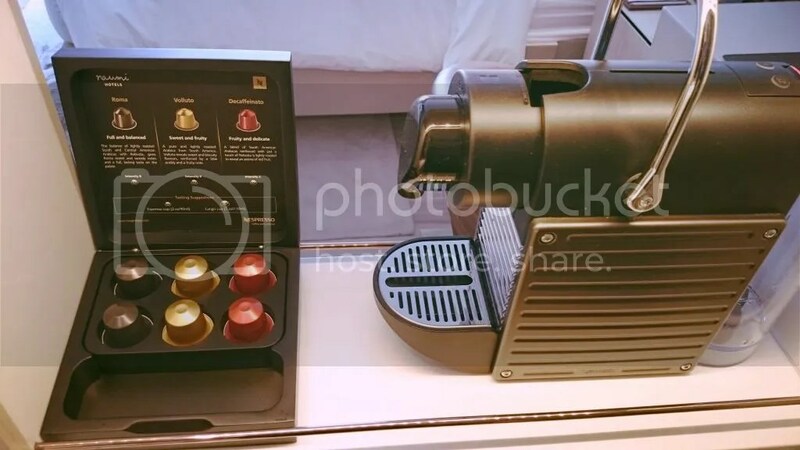 The mini-bar comes equipped with a Nespresso machine with coffee capsules too… Was only allowed to drink the decaf coffee as per instruction from the hubby. My hubby has forgotten to bring his charger along during the staycation. 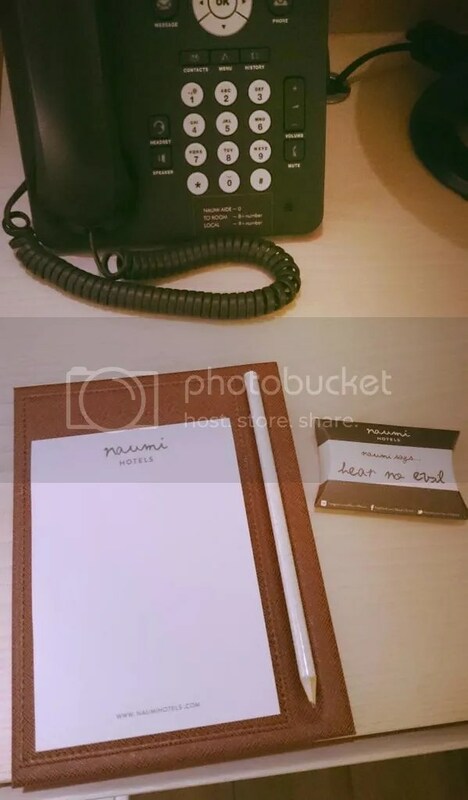 But he managed to get his phone charged and powered up as Naumi Hotel provide their guest with mobile chargers that works for most phones! 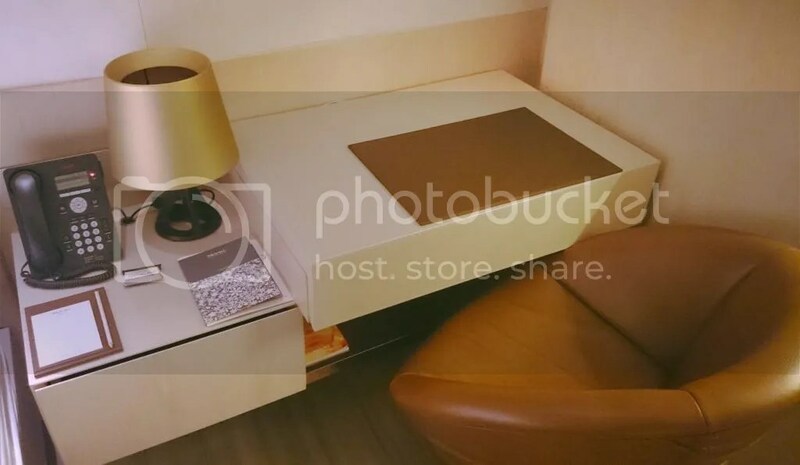 Try locating the charging station – It is well hidden within the work station! The vanity counter / washing area is designed to be part of the bedroom but i don’t quite like the design. 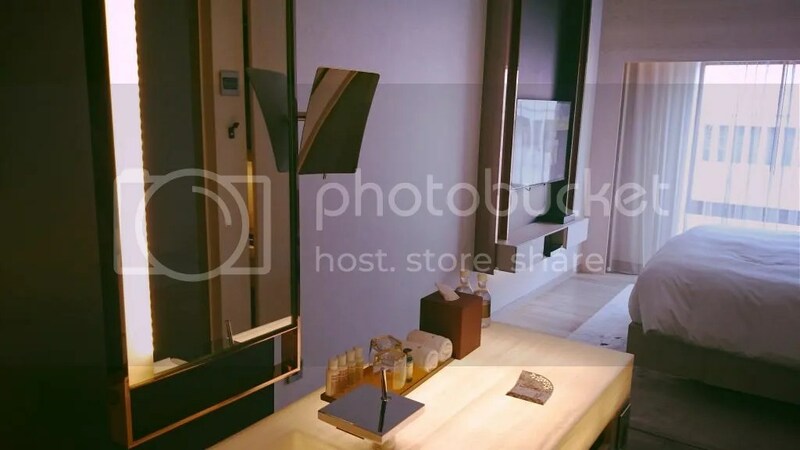 The bedroom floor will get splashes easily which makes the marble flooring slippery and prone to water stains… But I have to say that the glowing vanity counter is really intriguing and pretty!! 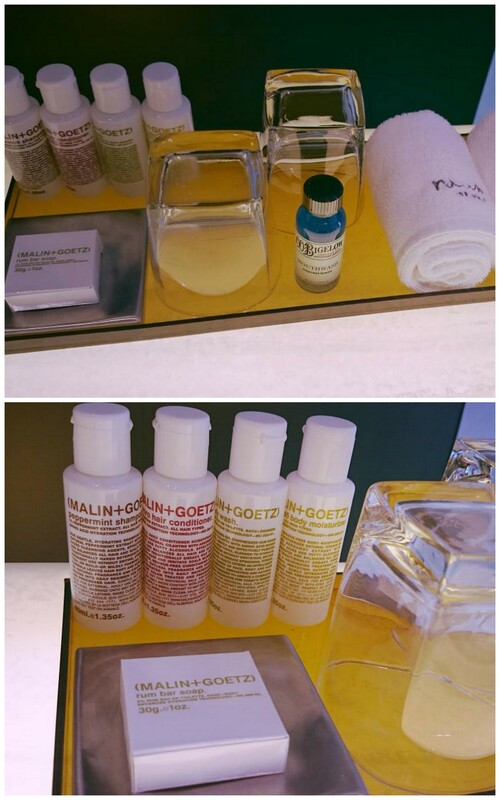 Naumi further pamper all its guests with MALIN+GOETZ toiletries and this unique product line is from New York. Not only it smells heavenly, they makes my skin and hair feels good as well. The hair dryer can be found hanging in the wardrobe (near to the bathrobe) and if you are afraid of the cold marble floor, no worries! 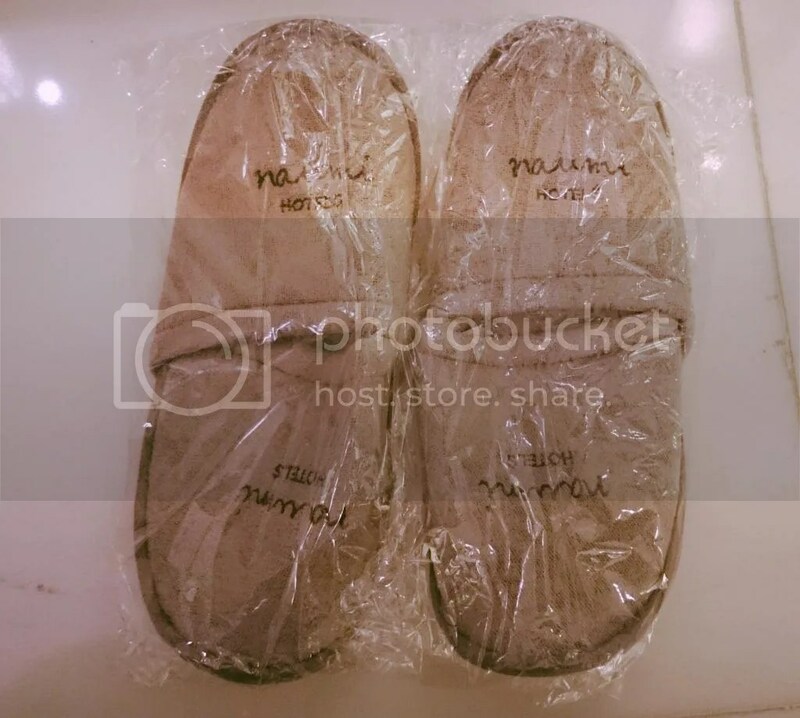 There’s bathroom slippers available which i have brought home as it will come in handy few months later. 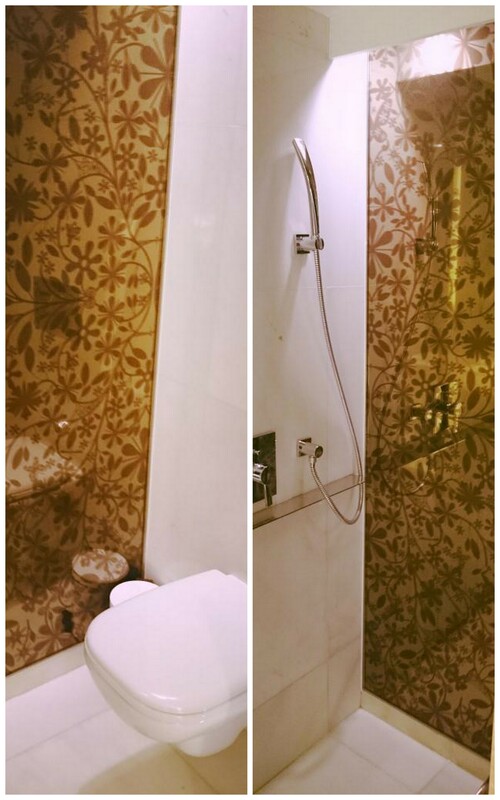 If you are worried that shower room and washroom lack in privacy due to the transparent glass doors, don’t worry as you can control your privacy. There’s a switch beside the bathroom which will make the transparent glass doors turn from transparent to opaque at the touch of a button. The shower room and bathroom are separated and i love this feature as i can take really long shower without worrying that my hubby needs to use the toilet… haha! Wanted to hit the roof top pool deck so that we can have a dip at the infinity pool but the pool closes at 6pm! Hence, we decided to chill at Cloud 9, the hotel’s outdoor bar located next to the pool side.. Retreated back to the hotel room for an hour before we head back to the poolside again. 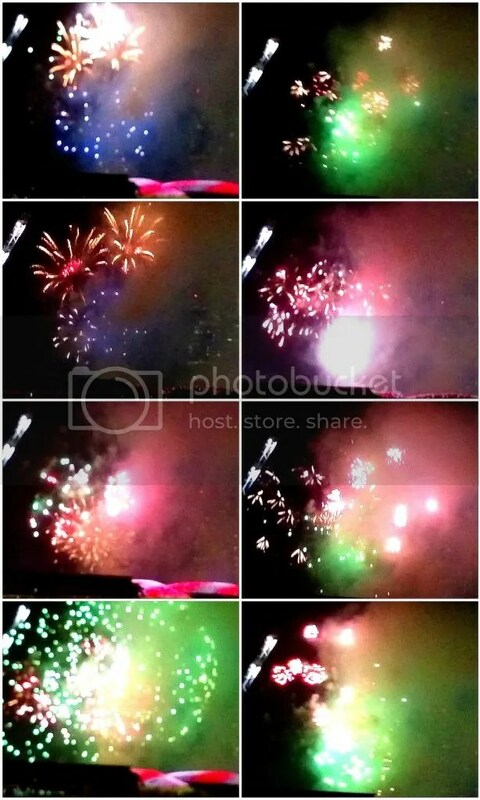 We spent sometime sitting at the couch admiring fireworks from the NDP preview parade while munching on canapes. 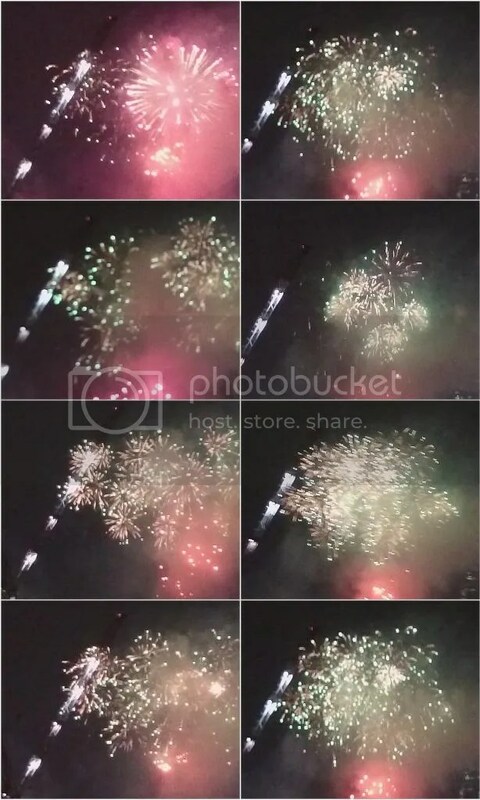 Really picturesque and experience is unforgettable. 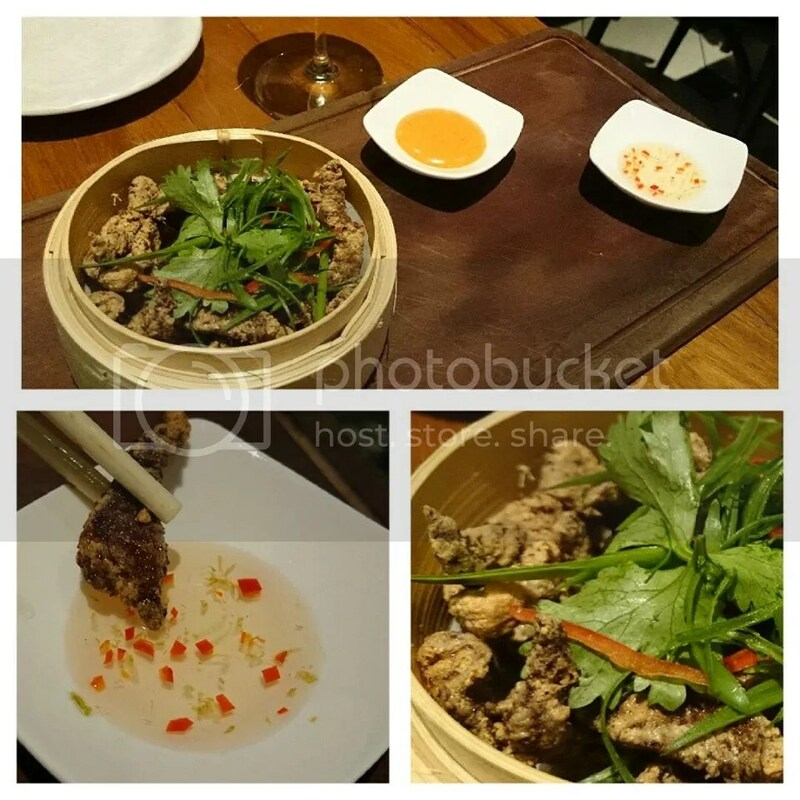 Went for dinner nearby at Halia at Raffles since it is highly raved by many due to its good food and service.. Indeed, food and service is superb! The waiter that was in charge of our table is very caring and attentive… He served me warm water without me asking and many times we were bothering him with our requests. Basically i cannot take raw food now and i have to be extra careful with the sauce / dips.. He explained patiently to us on the ingredients used for each of the sauce / dip to reassure that it is safe for my consumption. Food was served fast and we were grateful for that as we were famished! We ordered Deepfried Salt and Chilli Wagyu Beef as our starter and the Wagyu Beef is well seasoned & balanced without being too overwhelming. It was also fried to perfection – Crispy and not oily. You have to try the transparent sauce that comes with it and my hubby said that it is the best sauce ever..
Hubby ordered the Halia Chilli Crab and he enjoyed it very much The entire spaghetti dish comes ‘coated’ with a generous amount of fresh crab meat. 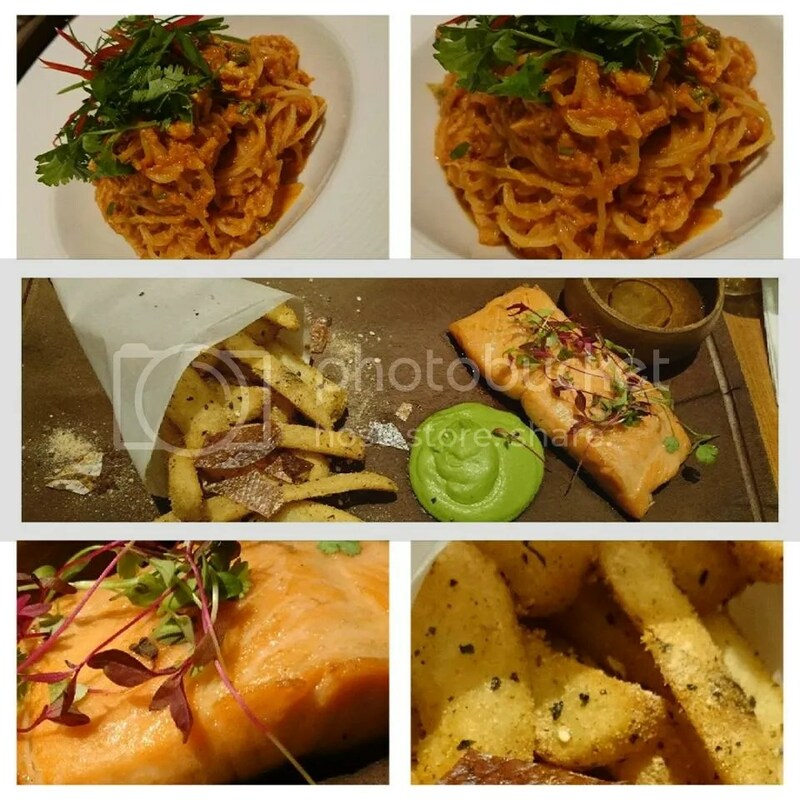 The chilli crab sauce was rich and savory as well..
Decided to go for a fish main course so i ordered the Fish and Chips lightly cured ocean trout fillet. Waiter told me that he will get the kitchen to cook it well-done. Fish was very fresh and despite being well-done, it wasn’t dry! First time trying out ocean trout and it kinds of reminded me of salmon (Just that it taste lighter). The wasabi fries was good as well and surprisingly it wasn’t ‘choking’. Was so tired that i went into deep slumber instantly once i lie down on the comfy bed! Woke up famished despite the feast we had the night before… Thank God for the yummy buffet breakfast and i truly enjoy the waffles, toast, cereal, grilled tomato, scrambled eggs & yogurt (I think i had more than these but i cannot remember the complete list of food that i have eaten). Also went for a quick dip in the infinity pool after breakfast while enjoying the nice morning view of the skylines..
Time goes so fast when you are having fun but i’m glad that it is well spent with my loved ones! Looking forward to the next staycation (Hint Hint!) hahaha! Ceutical Plus Aqua-Collagen Hydration Series – The Key to Firm & Hydrated Skin!